My husband Neil, my daughters Flora 7years and Betty 4years moved into the village in August 2008. We moved up from Brighton straight after our wedding for Neil to start work as the new manager of the Tree Shop. 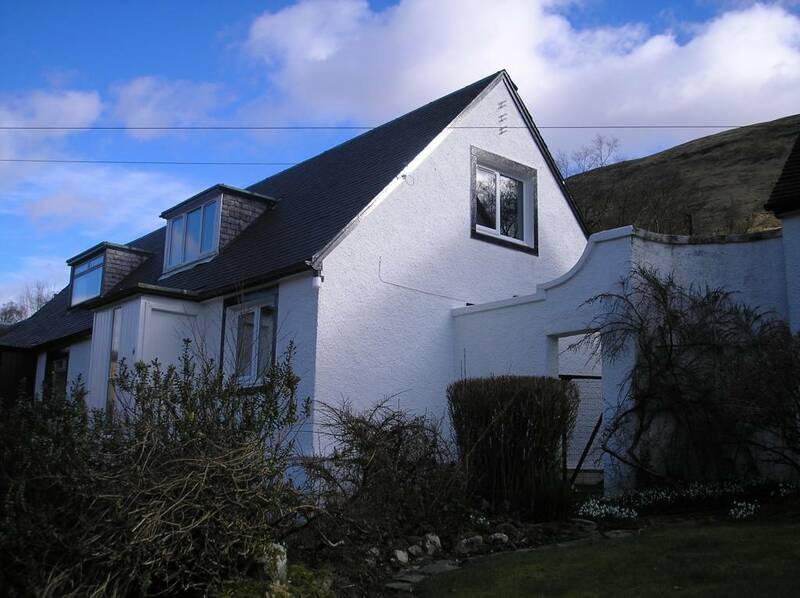 After 6 months staying just outside Strachur, 4 Hydro cottages became available for rent. The previous tenant had been chef in the Oyster Bar. The cottage has steps up to the front door leading into the living room which stretches to the back of the house, and has a window on the front and back walls, making it nice and bright. The carpets were replaced before we moved in so we requested lino to be laid at the back of the room where our dining table is. So much easier to clean up after the children have eaten. We have the sofas, TV, music, computer and dining table in this room, so this is where we spend most of our time. There are nick-nack shelves built against part of the wall. The heating in the house is all electric. The living room has a storage heater and a plug in wall heater, there is a switch for under floor heating, but it doesn't seem to work. There is a small room at the front right of the house which also has a storage heater and a built in cupboard. Unfortunately we don?t really use this room as it became a storage room for all the furniture we had nowhere else to put. Directly in front of the front door are the stairs. At the top of these is the bathroom with a bath, electric shower, sink, toilet and heated towel rail. The room has a big window, polystyrene tiles on the ceiling and is carpeted. To the left of the stairs is the biggest bedroom, we put the girls in here and painted it pink and blue. It has two tall fitted cupboards and five very deep fitted drawers along the back wall and a big dormer window at the front. It has a plug in heater. To the right of the stairs is another bedroom. It also has fitted drawers and one cupboard on the back wall. 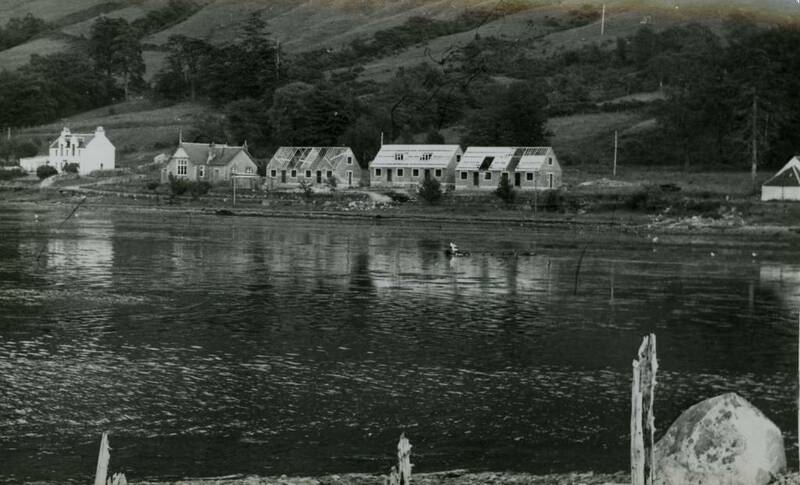 There is a large window on the gable wall which has lovely views over the loch. There is also a small hatch on the front wall which leads into the eaves where we can store some things. It is a pleasant room, but we soon discovered anything leather or wooden didn't store well in the cupboards when they came out covered in furry mould, so fortunately our leather jackets remain vacu-packed. This room also has a plug in heater. The kitchen is accessed from the back of the living room and is galley style along the back wall of the house. It has a large window on the back wall looking out over the garden. The sink is underneath the window with a small work surface on the left boxing in a boiler and beyond this is an electric cooker in the corner. To the right of the sink is another work surface with a wall mounted microwave above. On the opposite wall is a high shelf with cup hooks, over a kitchen unit with three drawers and cabinets, and a tall fridge/freezer (bought with wedding gift money). Next to this is a door. The side wall accesses a walk in cupboard, shelved on one side and with the washing machine plumbed in at the other side. There is a small wall mounted heater on the wall. The door beside the fridge/freezer leads out to a back hallway where we keep our bikes, a shoe rack and a coat rack. There is a clothes airer on the ceiling which is usually hung with waterproofs. This is the entrance we always use to come and go from the house. Leading off the back hallway is a big shelved walk-in cupboard which houses all our tools, hoover etc. A very useful space. The garden was very overgrown when we arrived and I'm still clearing the border around the front lawn. I think a keen gardener lived here at one time as there are quite a few rose bushes, hydrangeas and bulbs hidden around. The back garden is also lawned with a lot of washing lines crossing over it. I've cleared a space in the rough ground beyond the back fence and put two compost bins there. 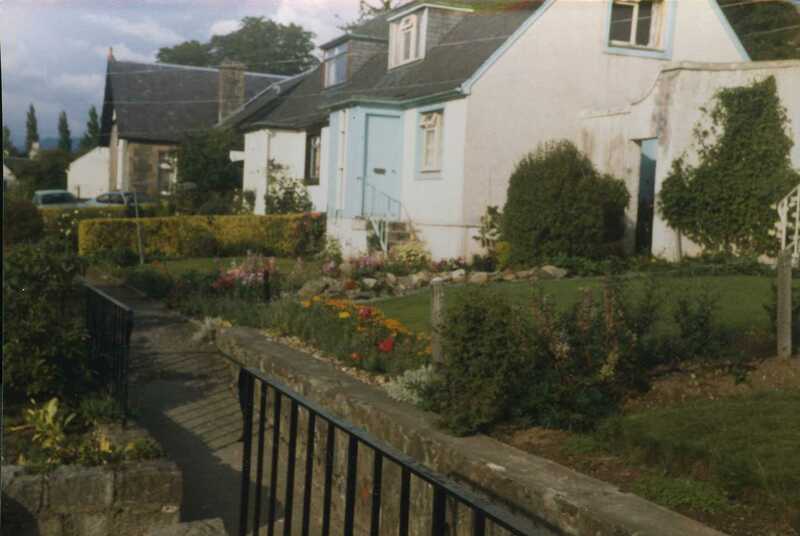 We're hoping to build a raised bed at the left side of the lawn to grow some veg and plant herbs in the narrow borders at the start of the lawn. We felt settled into the house and village very quickly and all enjoy the slower pace of life compared to the one we lived in Brighton. After six months our first winter in the house we are starting to work out the best ways to cope with condensation and damp, things we never had to think about living in the south. But these are quickly forgotton when you look out across the loch, its so beautiful. 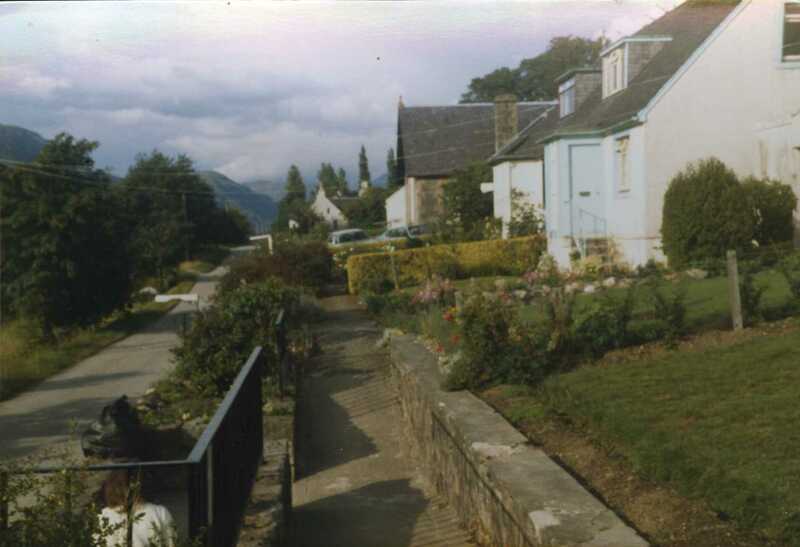 The cottage is semi-detached and joined to us is May Wilson whom we don't often see. On the other side of us are Bob and Maggie with Dexter the dog and two cats Parker and Fudge. They are all lovely neighbours and have made us feel very welcome.